Most early anthropologists classified the Egyptian religion as polytheistic. However this model and classification broke down as others began to study the Egyptian worldview in earnest. 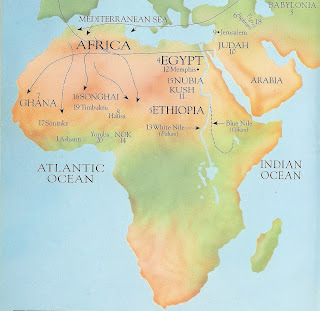 From the attributes of God set forth in Egyptian texts of all periods, Dr. Heinrich Karl Brugsch, Emmanuel de Rougé, and other eminent Egyptologists have come to the opinion that "the dwellers in the Nile valley, from the earliest times, knew and worshipped one God, nameless, incomprehensible, and eternal." Consider the following verses Dr. Brugsch compiled from the "Hymn to Amun Ra" and the Tomb of Princess Nesi-Khesnsu. "God is one and alone, and none other existeth with Him--God is the One, the One who hath made all things--God is a spirit, a hidden spirit, the spirit of spirits, the great spirit of the Egyptians, the divine spirit--God is from the beginning, and He hath been from the beginning, He hath existed from old and was when nothing else had being." "He existed when nothing else existed, and what existeth He created after He had come into being, He is the Father of beginnings--God is the eternal One, He is eternal and infinite and endureth for ever and aye--God is hidden and no man knoweth His form. No man hath been able to seek out His likeness; --His name remaineth hidden; He begetteth, but was never begotten; He createth, but was never created." "God Himself is existence, He endureth without increase or diminution, He multiplieth Himself millions of times, and He is manifold in forms and in members-- He is the Creator of the heavens, and of the earth. God hath stretched out the heavens and founded the earth-What His heart conceived straightway came to pass, God is merciful unto those who reverence Him, and He heareth him that calleth upon Him. God knoweth him that acknowledgeth Him, He rewardeth him that serveth Him, and He protecteth him that followeth Him." The word God here has been translated from Amun-Ra, Nebertcher* or Neter. Ancient Egyptian Religion is predicated upon a simple but profund concept -that all that is Created is actually an expression of one indivisible being. That being manifests as apparent objects and multiplicity in Creation. This being was referred to as Neter and its expressions were termed "Neteru." 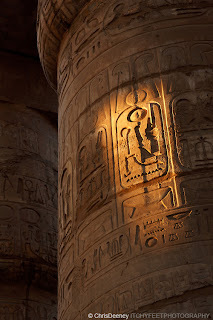 Neter means "Divinity" and Neteru means "aspects of the original divinity". The notion of Amun represents an insight of the Ancient Egyptian philosophy concerning the nature of the un-manifest aspect of all existence and the understanding of human consciousness. This teaching speaks of God as an un-manifest, nameless, formless, Being of Light which is the source of all that is manifest. 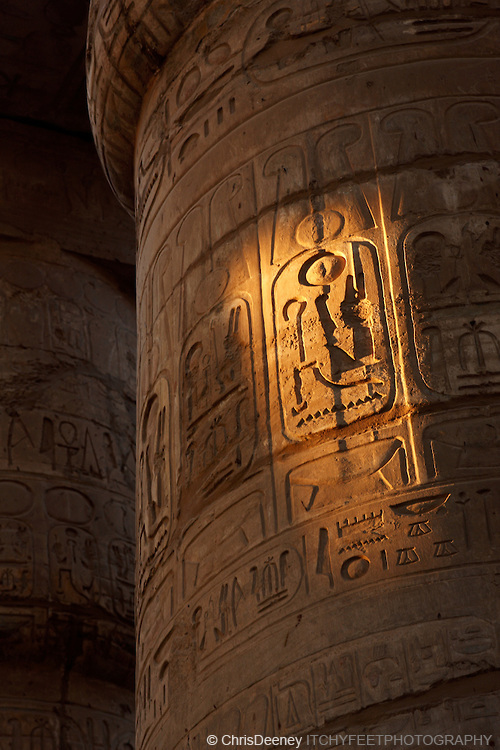 Ra symbolizes the physical representation of this "light". In other words, Amun-Ra represents the concept of bringing the un-manifest into manifestation. It must be acknowledged that Egyptian religion lies beyond the simple Western labels of monotheism and polytheism. Monotheism means (to the West) an exclusive, personified deity who exists in fact and is separate from creation. It is the belief in or worship of only One God, but does not exclude that fact that there could be two, or three or four (presumptively false) gods that others worship. From the Ancient Egyptian's view, however, monotheism would imply that God is the only reality that truly exists and therefore all that exists is an expression of the Divine. In other words God expresses as nature, the stars, your body, your thought, your senses, all physical objects, etc. This view is actually closer to Monism. Monism means that there is a recognition that there is only one reality that exists: God. All else is imagination. The Egyptian's outlook doesn't neatly fit the classification defining them as polytheists who worshipped many gods either. Let's look at what this actually means. The word worship is derived from the Old English weorthscipe, meaning worthiness or worth-ship — to give, at its simplest, worth to something. (Likewise "praise" is defined simply the act of making positive statements about a person, object or idea, either in public or privately). So in this original sense one can give worth to whatever is deemed worthy- one's spouse or partner, relatives, ancestors, trees, the stars, the sun etc. Now, the Egyptians didn't use the word god or gods. They, rather, revered or gave worth to the Neteru, which to them, were actually encodings of particular energy patterns seen with certain qualities and moods to help the mind relate to them more readily. In other words they valued nature and thought it worthy of respect. "If you are searching for a Neter, observe Nature." "The best and shortest road towards knowledge of truth [is] Nature." 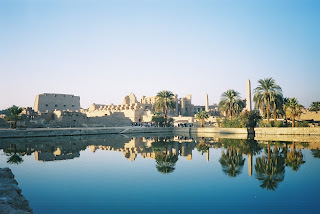 ~From the Outer Temple at Luxor, Egypt. To say Egyptians were polytheists because they worshipped many gods is also misleading because it assumes our current mindset can explain their worldview without even attempting to understand it. What is clear now is that Egyptians used images to construct their written alphabet. These images represented sounds as well as ideas. 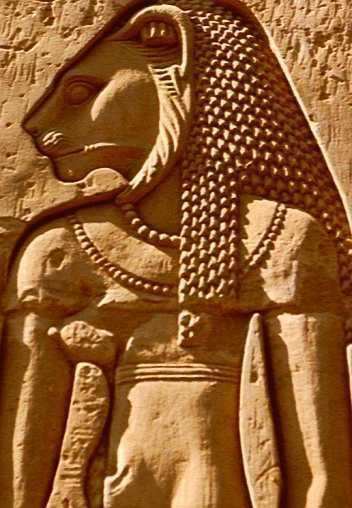 For example the Neter Sekhmet is represented as having the head of a lioness and the body of woman. Sekhmet represents passion and fierceness symbolic of the power with which a mother lioness, protects her cubs. She is a champion and a warrior. In an esoteric sense she is the one who paves the way for spiritual evolution by destroying the evil of ignorance and sinfulness in the human heart. Did Egyptians believe there was actually a being with a lion head and a woman's body? Of course not. This was a symbol, expressing an idea and an aspect of the Divine. Another misunderstanding we have coming from early Western interpretations is the notion that Egyptians were pagan or heathen. Again, many, as Christians, see the world this way. But let's inspect. Originally, the English word “heathen” simply meant “the people out on the heath”. It was a contemptuous word that town-people used of the poorer or rural people who lived outside the town walls. (The word “peasant”, which is of French origin, from pais, “district”, “country”, has the same [contemptuous] meaning. “Country people”, “rural people”.) 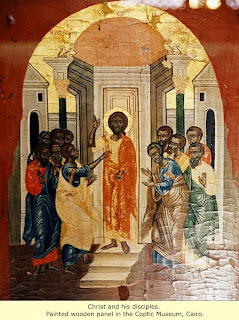 In the New Testament, what some bible-translators have rendered as “heathen” (or “pagan” or “gentile”), is in the Greek text ethnos (“nation”), ethnoi (“nations”),ethnikos (“of the nations”) or ethnikôs (“after the manner of the nations”). In the Old Testament, the Hebrew word which some bible-translators have rendered as “heathen”, is gowy, plural goyim, meaning “nations”. In other words, where the scriptures are simply referring to "other nations" they have been translated as heathen. Sadly, English translators have misled us and corrupted our worldview with their judgment laden definitions. All of these misunderstandings and misinterpretations, intentional or otherwise, have led us to the our present state of complacent ignorance about our own heritage and some very insightful understanding about the nature of the cosmos and our reality. Because what all of Egyptian religion amounted to was the overcoming of negative distractions and the development of spiritual enlightenment. "Man is to become God-like through a life of virtue and the cultivation of the spirit through scientific knowledge, practice and bodily discipline." 'The body is the house of God. That is why it is said, 'Man know thyself.'" 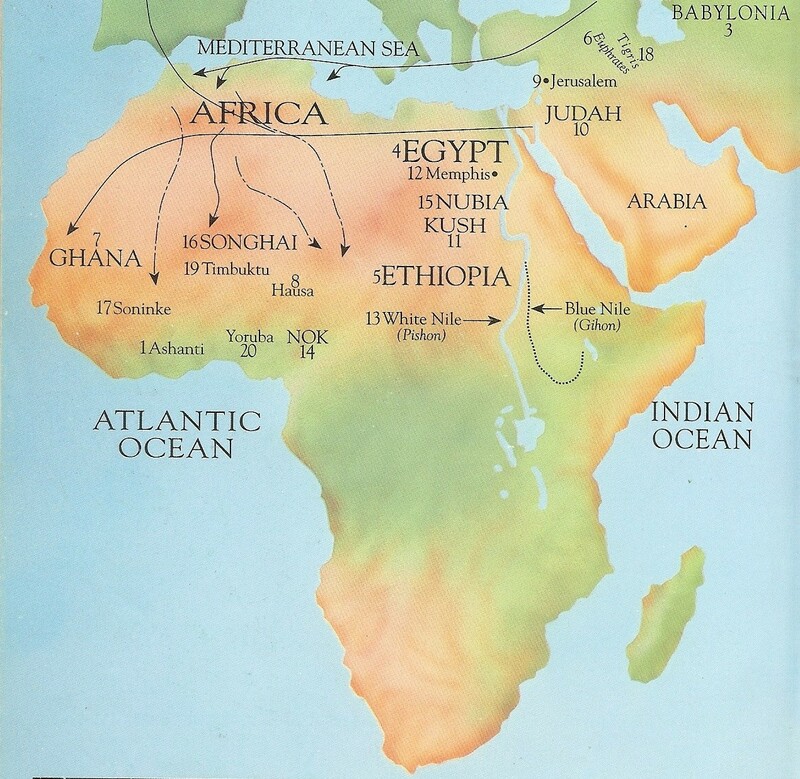 Ultimately, the view Ancient Kemet gave us was that all is inter-connected and that there is unity in the multiplicity of nature and in the reality we see- and don't see. "That they all may be one; as thou, Father, art in me, and I in thee, that they also may be one in us..."